The LTD EC-256 takes many of the coolest aspects of our higher-end EC Series models, and offers them to you in a super-affordable guitar that's ready to rock. 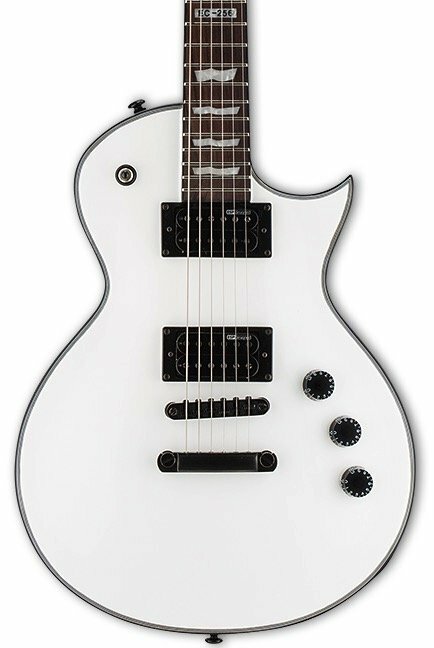 A classic shape that's excellent for all musical styles and genres, the EC-256 looks amazing in either Black Satin or Snow White finishes, and has multiple binding on the body and headstock like you expect from high-quality guitars. Playing the EC-256 is also a dream come true, with set-neck construction for fast and easy access to the highest frets. The EC-256 also features a mahogany body, a comfortable three-piece thin U-shaped mahogany neck, a rosewood fingerboard with flag inlays and 22 extra-jumbo frets, and great-sounding ESP Designed LH-150 pickups.